Florida’s tourism and marketing agency could be going away if the Florida House has its way. It comes as tourism remains the state’s dominant industry, and the state continues recovering from toxic algae blooms and hurricanes. Despite Hurricanes Michael and Irma, and the worst toxic algae bloom in a decade, Florida saw a record number of visitors last year. In addition to visitors from other states, Florida also saw gains in international tourists from Canada, the United Kingdom and Brazil. The numbers also show worsening trends—there were fewer visitors from Europe, South America and Asia. 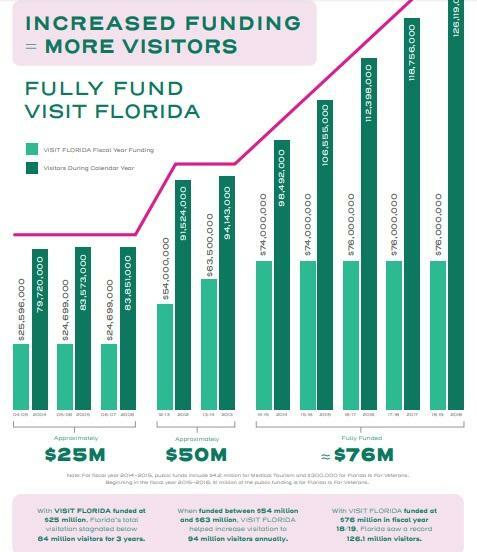 Visit Florida's budget has grown since 2004. So has the state's tourism numbers. “I realize members, this is the first cut at this, but like my colleague, I have some pretty serious concerns with where we are in this house budget," said North Florida Rep. Lorrane Ausley, (D-Tallahassee). North Florida Representative Lorrane Ausley is arguing against a House plan that would effectively defund Visit Florida. The chamber wants to give the tourism and marketing agency $19 million. That’s enough money to keep it running until it’s expiration date in October. “Allowing Visit Florida to sunset would be catastrophic to a state that counts tourism as a backbone of its economy," said Ausley. Two years ago Visit Florida ended up in the crosshairs of then-Speaker Richard Corcoran over contracts with celebrities like rapper Pitbull. The agency wouldn’t release its contracts with the musician which prompted a lawsuit. Ultimately, the CEO of the agency resigned. But before that, lawmakers were disgruntled about how much general revenue money was going to Visit Florida. It’s budget went from about $25 million a year in 2004 to $76 million in 2018 under former Governor Rick Scott. The agency wants to stay at that level, and is trying to prove its worth in areas that aren’t the tourist hot spots. “Visit Florida helps us market on par with the coastal counties and grow our community and our tourism," said Washington County's Heather Lopez in a video produced by Visit Florida. “Obviously the respective directors including Dana Young are doing their jobs and advocating for tourism in that case and I think the House’s position is clear," said House Appropriations Chairman Travis Cummings. That’s House Appropriations Chairman Travis Cummings. Governor Ron DeSantis wants to keep Visit Florida’s funding intact at current levels. But neither the House nor Senate do that. And while House leaders appear content to let the agency fall by the wayside, The Senate would give it $50 million with a caveat: it can’t spend that money on counties that ban sunscreen. “We also know the Governor and Senate are proposing [unintelligible] so, we will get through this week on the budget, pass a responsible budget, get to conference and see where we end up," said Cummings. Lawmakers will soon begin the process of hammering out their budget differences in varying committees. Any issues left unresolved would go to House Speaker Jose Oliva and Senate President Bill Galvano to work out. TALLAHASSEE --- Gov.-elect Ron DeSantis on Friday named an ardent opponent of Medicaid expansion to lead the state Agency for Health Care Administration and backed former state Sen. Dana Young to lead the tourism-marketing agency Visit Florida. Executives with Visit Florida must choose a new CEO after Ken Lawson was chosen to head the Florida Department of Economic Opportunity. Committee members are debating what type of person should have that job. Rebuilding Florida’s brand won’t be easy in the wake of Hurricane Irma.